I have nary a photo to show for it (okay, let's be real - maybe, like, two), not any particular story, nor any special defining moment. But all week long, I've felt like I've been walking on clouds. 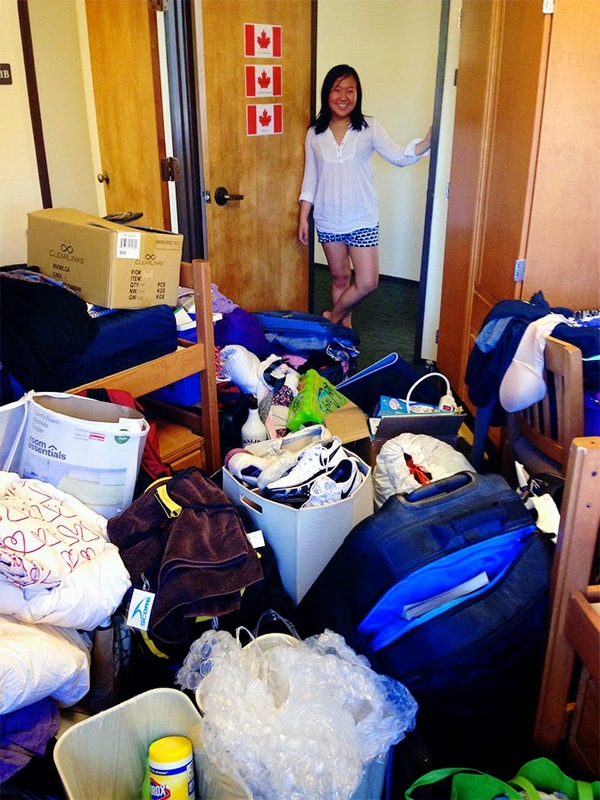 It all started last Sunday, when my sister and her boyfriend drove my stuff back to Stanford for me. Breathing in the sweet campus air, downing a thick juicy Umami burger, ordering my go to ice cream sandwich at CREAM, seeing a dear friend, feeling the sun on my back - here I am, again. Now, it was... perhaps after a shower, potentially after I dig my way through my sister's fridge, need to play with the cats for a bit... And then I casually checked the Caltrain schedule, saw that the next train was leaving in 13 minutes, and hightailed it out of the apartment with two bags in hand full of dirty laundry and a hairbrush. Oh how far the mighty have fallen from a rented SUV packed neatly with plastic Target containers. Tuesday. I came a week early to be trained as an advisor for our study abroad program this year. Tuesday, Wednesday, and Thursday were spent in counseling and public speaking sessions. I had the best time meeting new friends (it's still possible as a senior!) and getting to hear stories from Berlin, Beijing, Santiago, Paris, Moscow, Istanbul, Barcelona, Kyoto, Cape Town, Australia, and Madrid, and sharing my own from Oxford. It was the world in one room. Wednesday - the prodigal roommate's return. We haven't been separated for a minute (literally) since. Thursday and Friday - more and more people are back on the Farm! 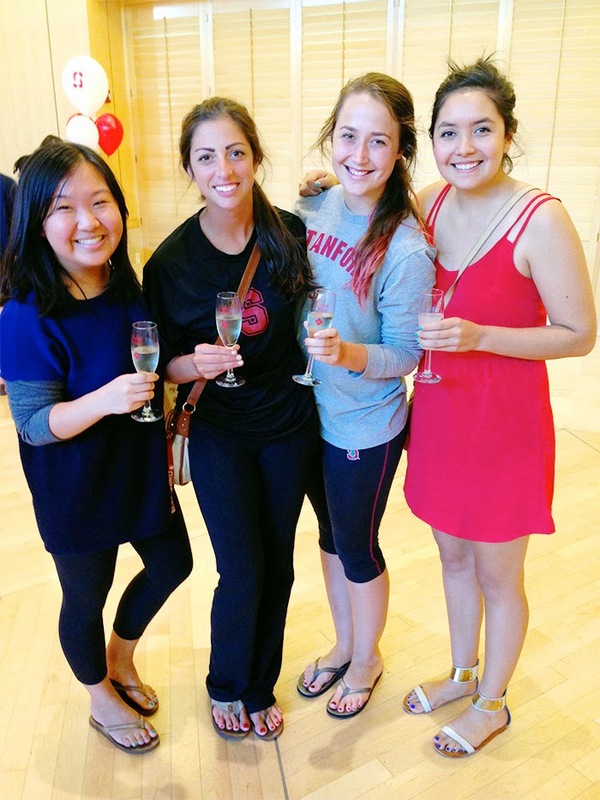 Sunday - the official (champagne-fueled) senior welcome. Plus Target. As always, plus Target. In so many ways, senior year is a whole different ball game. It's started off with a rumble. Not with any particular 'BANG!' but not calm water's sailing either. There's anticipation and excitement, and a bit of fear. There's the desperation for Monday not to come - once it starts, it's really going to end! There's a tangible atmosphere of 'the stress will hit soon' - jobs! GPAs! JOBS! But I've also never felt so free. This campus feels like it's ours completely, and it's also never felt more like home. You know this place like the back of your hand, you love this place with your whole heart. It's ours - it's 15's - right now. But then, in so many ways, it's just like that first day, that first sweltering day of freshman year, when we lugged boxes up the stairs, faces brave but hearts pounding. Wide-eyed, bewildered, and knowing that the best days were about to begin. Like then, I still don't believe I'm here. I still don't know exactly what I'm doing (but I've learned to fake it better). I'm still in awe of the people around me, still in disbelief that the weather is this perfect all the time, still in love with every inch of this beautiful, palm tree lined campus. I've come full circle, but oh how I wish I was still at that halfway point. Oh how I love your lovely description of the begining of senior year. I feel so old saying this but enjoy it because it is going to fly by. This fall is my first fall not returning to school and it is so bitter sweet...as much as I don't miss the anxiety that comes with school there is so much I do miss including textbooks and lectures. Happy monday pretty girl! so so exciting. there really is such a difference from freshman to senior year. can't wait to hear about all the antics! Enjoy every single second! It was my favorite year! You are going to have a blast, enjoy it every moment! gahh what i would give to go back to senior year. enjoy it!! It really is so fun to see the difference between freshmen and senior year. I know I tell you all the time, but my life long friends were my college friends. Enjoy every second of your year!! Gosh I wish we had Target in Europe. It sounds amazing. I enjoyed reading this. Gotta love college life! Looking back, the best times of my life were those years in college.